Iran did not wait too long after the meeting, which some have described as historic , between the cleric, Muqtada al – Sadr, and the leaders of the militias “popular crowd” in Najaf last week, even begun moves to hold a meeting conciliatory between Muqtada al – Sadr the head of the “coalition of the rule of law , ” the former prime minister, Nuri al – Maliki, after ten years of estrangement , which amounted to raise arms against al – Maliki by Sadr ‘s supporters, and the pursuit of al- Sadr and his followers in the “Mahdi Army” by the previous government. Iran did not wait too long after the meeting, which some have described as historic, between the cleric, Muqtada al-Sadr, and the leaders of the militias “popular crowd” in Najaf last week, even begun moves to hold a meeting conciliatory between Muqtada al-Sadr and President of the “coalition of the rule of law,” Prime Minister previously, Nuri al – Maliki, after ten years of estrangement, which amounted to raise arms against al – Maliki by Sadr ‘s supporters, and the pursuit of al- Sadr and his followers in the “Mahdi Army” by the previous government. , the leader of the “coalition of the rule of law , ” Salah Abdul – Razzaq, said that the current political and military situation requires concerted efforts to solve problems, calling not to personifying the things in the dispute between the chest The al – Maliki. Furthermore, he said the leader of the “coalition of the rule of law,” Salah Abdul-Razzaq, said that the current political and military situation requires concerted efforts to solve problems, calling not to personifying the things in the dispute between al-Sadr and al-Maliki. Said Abdul Razak, a close al – Maliki of the leaders, that the secondary differences are not in the interest of the battle with al “Daesh , ” noting, through a press statement, that the current situation requires close ranks, abandoning the political harassment. Said Abdul Razak, a close al- Maliki of the leaders, that the secondary differences are not in the interest of the battle with al “Daesh,” noting, through a press statement, that the current situation requires close ranks, abandoning the political harassment . relationship between Muqtada al – Sadr and Nouri al – Maliki and worsened dramatically after the latter took power in 2006, and launched military campaign and wide against the militia “Mahdi Army” of the released in 2008 in Basra (590 kilometers ) south of Baghdad, part of a military operation then called “Charge of the knights”, and resulted in the deaths and arrests of hundreds of elements of Sadr ‘s movement, and the flight of Moqtada al – Sadr to Iran. The relationship between Muqtada al-Sadr and Nouri al-Maliki and worsened dramatically after the latter took power in 2006, and launched large-scale military campaign against the militia “Mahdi Army” of the released in 2008 in Basra (590 kilometers) south of baghdad, part of a military operation then called “Charge of the Knights”, and it resulted in the deaths and arrests of hundreds of elements of the Sadrist movement, Muqtada al-Sadr and the flight to Iran. MP for the coalition of state law, Abbas al-Bayati, Thursday, near the end of the Prime Minister Haider al-Abadi to resolve the vacant ministerial portfolios, and pointed to submit candidates for three ministries leaving only defense, as he emphasized that Abadi send CVs of the candidates to the House of Representatives for presentation to a vote during the next week. The Prime Minister Haider al-Abadi, announced in the (30 September 2016), seeks to provide candidates to the House of Representatives to fill the vacant ministries, as pointed out it is “not Superman” to manage all ministries by proxy. Twilight News / announced Iraqi army killed a top aide to the leader of al Daesh aerial bombing near Mosul. A statement by the army command airline responded to the Twilight News, said the air strike based on intelligence information targeted site presence of Abu Osama, an aide to organize Daesh leader Abu Bakr al-Baghdadi Tlsagv in a town near Mosul. He added that the bombardment had killed the leader of Bdaash and a number of his aides. U.S. Defense Secretary Ash Carter meets Turkish Prime Minister Binali Yildirim in Ankara on October 21, 2016. Turkish Prime Minister Binali Yildirim says Turkey is ready to “take measures” in northern Iraq because Ankara is not satisfied with promises from the United States and Baghdad about the role of Kurdish militants and Shi’ite militia fighters in the battle for Mosul. Yildirim made the remarks late on October 22 after Iraq’s Prime Minister Haider al-Abadi rejected a call by U.S. Defense Secretary Ash Carter’s for Baghdad to give Turkish forces a role in recapturing the northern Iraqi city from Islamic State (IS) militants. Abadi said after meeting with Carter in Baghdad on October 22 that he knows Turkey wants to participate in the battle for Mosul. Yildirim expressed concern about the way Shi’ite militia and fighters from Turkey’s outlawed Kurdistan Workers Party (PKK) might treat Sunni Arab residents of Mosul after the city is recaptured from IS militants. The U.S. defense secretary’s talks with Abadi on October 22 came a day after Carter said he’d reached “an agreement in principle” with Ankara about a role for Turkey’s military in the battle for Mosul. Carter stressed that any final decision would be up to Baghdad, but also expressed hope that the Turks and Iraqis would be able to resolve their differences. On October 22, Carter admitted to reporters that the issue of a Turkish role in the Mosul campaign was a difficult subject. He said the United States has a role “to work with our partners in the coalition and the Iraqi government to try to resolve issues like this and make sure that we’re all focused” on fighting against IS militants. Turkey, a regional power with the second largest armed force in NATO, has at least 500 and as many as 1,000 soldiers stationed at a military camp at Bashiqa in northern Iraq — about 24 kilometers to the northeast of Mosul. 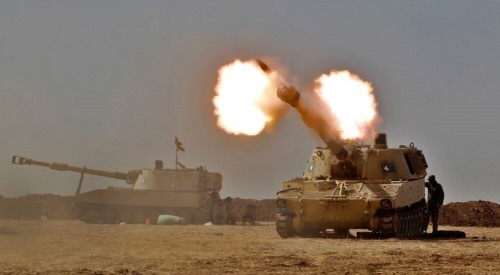 Posted there at the invitation of Iraq’s northern Kurdish autonomous region, the Turkish forces have been training Sunni Muslim tribal fighters and Iraqi Kurdish Peshmerga in Bashiqa since late 2015 when the town was recaptured from IS. But the Turkish military presence has sparked a dispute with Iraq’s Shi’ite-led government in Baghdad, which wants its forces to be at the forefront of the offensive and has repeatedly called for the Turkish troops to leave the country. Washington has been urging Ankara and Baghdad to resolve the dispute. It has said that any foreign forces in Iraq should be there with the approval of Iraq’s government in Baghdad and should also fall under the umbrella of the U.S.-led coalition against IS. While Turkey has been supporting Iraq’s Kurdish Peshmerga fighters within the U.S.-led coalition, Ankara also been carrying out air strikes in northern Syria against U.S.-backed Syrian Kurds that also are part of the coalition — the Syrian Kurdish Democratic Union Party (PYD) and its People’s Protection Units (YPG). Turkish President Recep Tayyip Erdogan has vowed that he will not allow the PYD and YPG to create a Kurdish stronghold in northern Syria along Turkey’s southern border, saying that it would bolster fighters from the outlawed PKK — which both Ankara and Washington consider to be a terrorist group. Erdogan alleges that there are links between the outlawed PKK in Turkey and the U.S.-backed PYD in northern Syria. He Carter – following his meeting with Prime Minister Haider al – Abadi Day -in front of a gathering of US soldiers in Iraq satisfaction with the process so far and that the debate is not about the possible role in the future of US forces after the restoration of Mosul , but also on the urgent need for humanitarian aid and reconstruction. 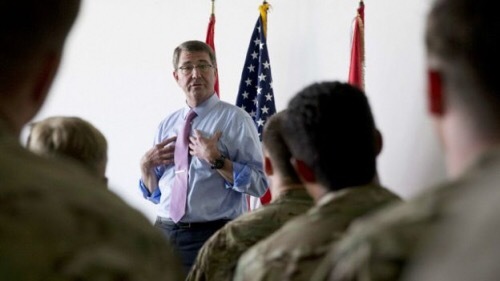 he said US Secretary of defense , ” while defeated Daesh gradually in major cities will resort more to the kind of tactics of the insurgency, will therefore imperative that we help the Iraqis protect themselves “if Iraq requested such support. official statistics of the Armed Forces announced the 1120 terrorist gangs of Daesh including suicide bombers in the northern hub of operations edit Nineveh / Mosul dam province killed.